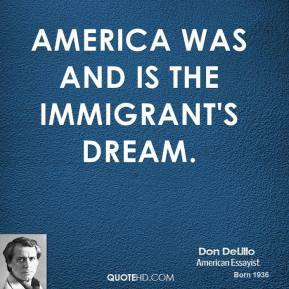 America was and is the immigrant's dream. 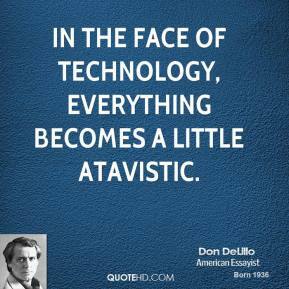 In the face of technology, everything becomes a little atavistic. 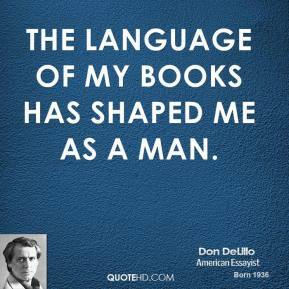 The language of my books has shaped me as a man. 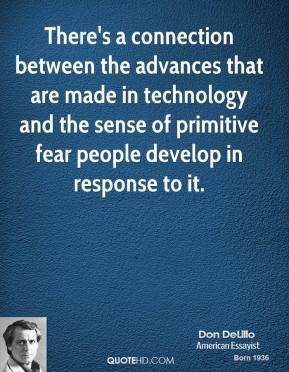 There's a connection between the advances that are made in technology and the sense of primitive fear people develop in response to it. To be a tourist is to escape accountability. Errors and failings don't cling to you the way they do back home. You're able to drift across continents and languages, suspending the operation of sound thought. Tourism is the march of stupidity. You're expected to be stupid. The entire mechanism of the host country is geared to travelers acting stupidly. You walk around dazed, squinting into fold-out maps. You don't know how to talk to people, how to get anywhere, what the money means, what time it is, what to eat or how to eat it. 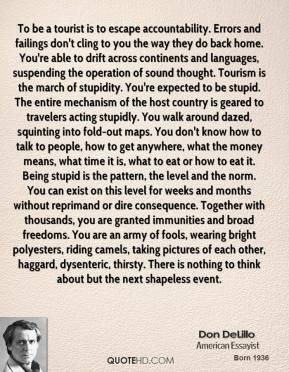 Being stupid is the pattern, the level and the norm. 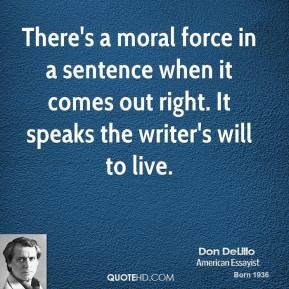 You can exist on this level for weeks and months without reprimand or dire consequence. 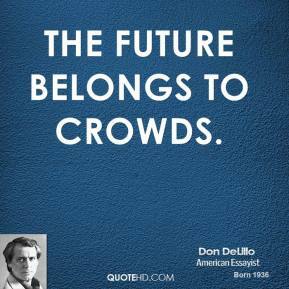 Together with thousands, you are granted immunities and broad freedoms. You are an army of fools, wearing bright polyesters, riding camels, taking pictures of each other, haggard, dysenteric, thirsty. There is nothing to think about but the next shapeless event. Thousands stand and chant. Around them in the world, people ride escalators going up and sneak secret glances at the faces coming down. People dangle teabags over hot water in white cups. Cars run silently on the autobahns, streaks of painted light. 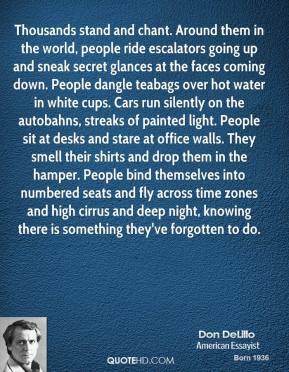 People sit at desks and stare at office walls. They smell their shirts and drop them in the hamper. 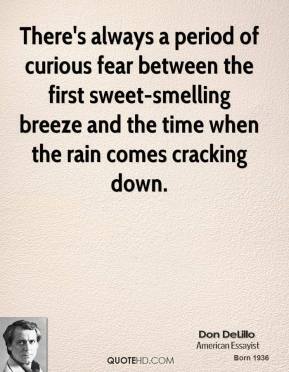 People bind themselves into numbered seats and fly across time zones and high cirrus and deep night, knowing there is something they've forgotten to do. 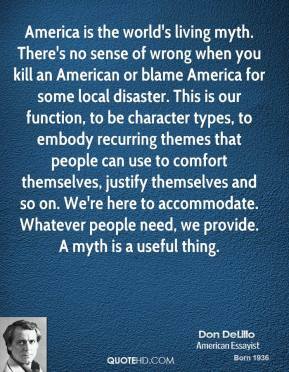 America is the world's living myth. There's no sense of wrong when you kill an American or blame America for some local disaster. This is our function, to be character types, to embody recurring themes that people can use to comfort themselves, justify themselves and so on. We're here to accommodate. Whatever people need, we provide. 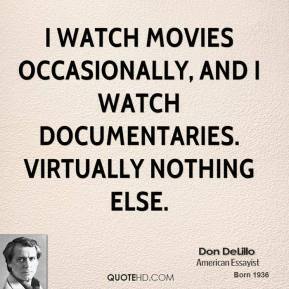 A myth is a useful thing. I think it's only in a crisis that Americans see other people. 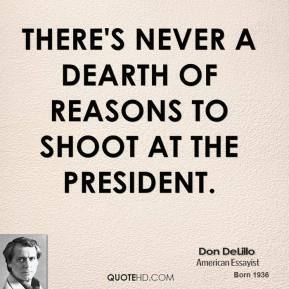 It has to be an American crisis, of course. If two countries fight that do not supply the Americans with some precious commodity, then the education of the public does not take place. 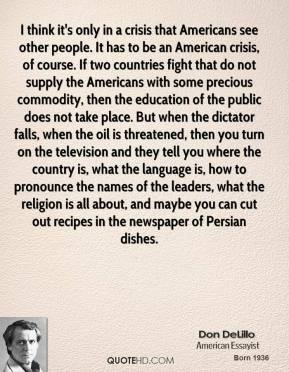 But when the dictator falls, when the oil is threatened, then you turn on the television and they tell you where the country is, what the language is, how to pronounce the names of the leaders, what the religion is all about, and maybe you can cut out recipes in the newspaper of Persian dishes. 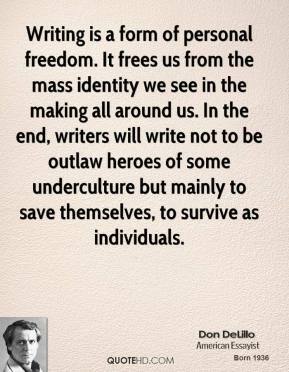 Years ago I used to think it was possible for a novelist to alter the inner life of the culture. 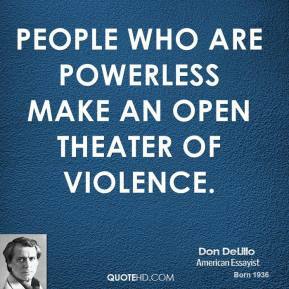 Now bomb-makers and gunman have taken that territory. 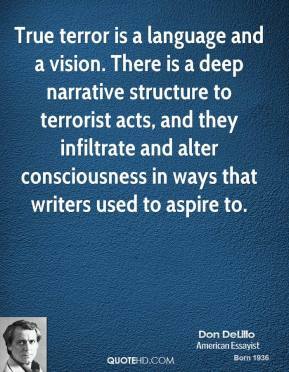 They make raids on human consciousness. 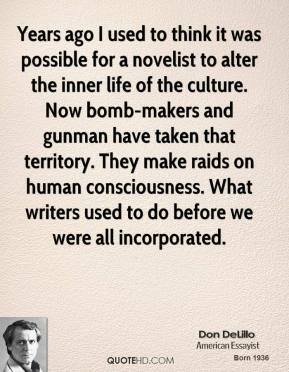 What writers used to do before we were all incorporated. 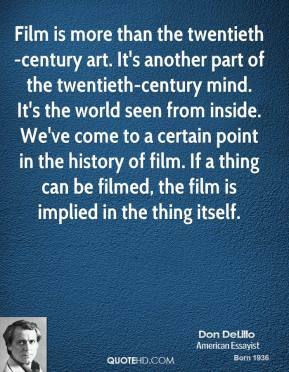 Film is more than the twentieth-century art. 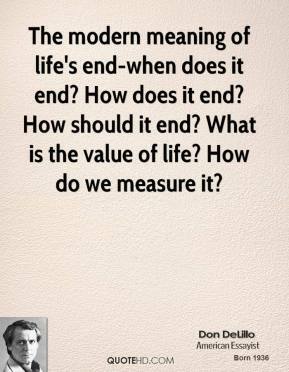 It's another part of the twentieth-century mind. It's the world seen from inside. We've come to a certain point in the history of film. If a thing can be filmed, the film is implied in the thing itself. The figure of the gunman in the window was inextricable from the victim and his history. 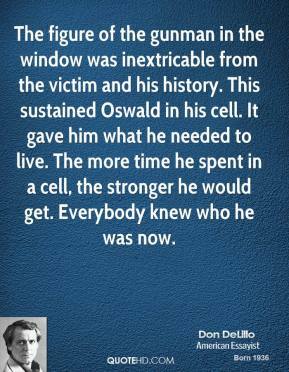 This sustained Oswald in his cell. It gave him what he needed to live. The more time he spent in a cell, the stronger he would get. Everybody knew who he was now. 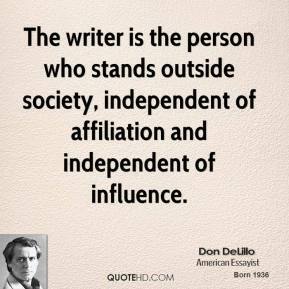 If we are on the outside, we assume a conspiracy is the perfect working of a scheme. Silent nameless men with unadorned hearts. A conspiracy is everything that ordinary life is not. It's the inside game, cold, sure, undistracted, forever closed off to us. 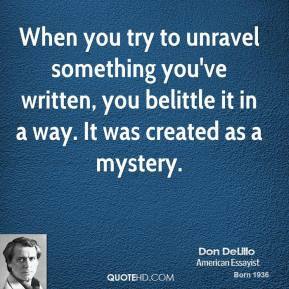 We are the flawed ones, the innocents, trying to make some rough sense of the daily jostle. 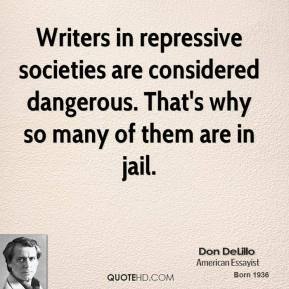 Conspirators have a logic and a daring beyond our reach. 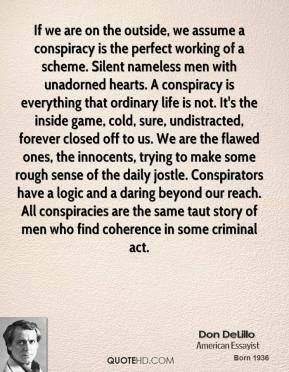 All conspiracies are the same taut story of men who find coherence in some criminal act. 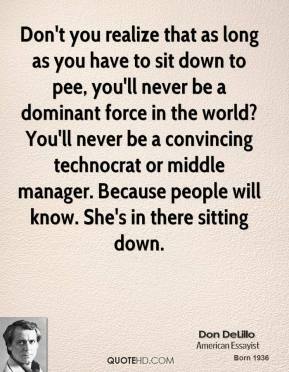 Don't you realize that as long as you have to sit down to pee, you'll never be a dominant force in the world? You'll never be a convincing technocrat or middle manager. Because people will know. She's in there sitting down.